A few months ago took an online course called ‘Debunking PCOS‘ which is all about improving fertility and conquering Poly Cystic Ovarian Syndrome which I was diagnosed with over 10 years ago. The thing that really surprised me about the course was that the number 1 action we were encouraged to take was to heal your gut. Not exactly the most glamorous topic, but when you consider how important the gut is to helping you absorb and use the nutrients you need, it really makes sense. A healthy gut isn’t just important for fertility. It impacts everyone’s health. Well funnily enough, earlier in the year I went to a workshop on how to ferment vegetables. It was led by Sandor Katz, author of ‘Wild Fermentation’ and ‘The Art of Fermentation’. And was completely inspirational. So what is the number 1. way to improve your gut health? Easy. Eat more fermented foods! Yoghurt is probably the first thing that comes to mind. And if you’re happy with eating your yoghurt then that’s great. But the wonderful world of fermented food doesn’t stop there. Fermenting vegetables is a brilliant habit to get into. Especially if you’re trying to keep away from dairy so yoghurt isn’t a good option for you. But even if you’re happy with your yoghurt, adding fermented vegetables to your repertoire is only going to help your gut. I love the tangy crunch of a home fermented baby carrot. And the best part is, if you make them yourself then you can control how mild or ‘funky’ they taste. I’ve never been a huge fan of commercial sauerkraut, but regularly make and eat it now that I know how good it can taste when you don’t ferment it too far. And what about Number 2? That’s easy too. Just stop eating inflammatory foods which include refined carbohydrates and vegetable oils. If you’re nervous about the whole fermentation thing, the good news is apparently no one has ever died from eating fermented veg. So it’s safe! This method is a great place to start because it’s suitable for pretty much all vegetables. My favourites so far are carrots, zucchini (which turn out like pickles), red chillies and celery. I’m also keen to try onions. Will keep in the fridge for months. 1. Scrub veg. Trim or chop into bite sized pieces. Peel if you prefer (I don’t bother). 2. Pack the veg into your jar. 3. Combine salt and water and stir until dissolved. Shouldn’t take too long. 4. Pour salted water over the veg to cover them. You probably won’t need all the liquid. If the veg aren’t covered, make up more brine so they are covered. 5. Close jar and leave somewhere you will see it but not in direct sunlight. 6. Every day open jar to release any built up gas (CO2). Start tasting after about 3 days. When you’re happy with the flavour (ie it tastes acidic or tangy enough for you) pop the jar in the fridge and start eating. Or if the veg start to soften, it’s time to refrigerate. Generally 4-5 days is a good amount of time for fermentation but if you’re living somewhere really warm it may not take that long. And really cold climates may take longer. veg – use your imagination. Cauliflower, carrots, zucchini, chillies, beets, celery, cucumber, watermelon rind, baby eggplant, capsicum (bell peppers), green tomatoes, chard stems. Sandor Katz did say that the only thing he doesn’t like to ferment are veg with lots of chlorophyll. So anything too green like kale isn’t great. And from my notes watermelon rind tastes like cucumber pickles. flavourings – feel free to add in flavourings such as cumin seeds, fennel seeds, coriander seeds, bay leaves, preserved lemon, lemon zest, thyme, rosemary, sage. salt – I use a finely ground sea salt but Sandor said it doesn’t matter so much. lower salt – it is possible to ferment without the salt or use lower quantities, the problem is that salt helps to keep the veg texture nice and crisp so unsalted or low salt veg can end up mushy. Which might be OK for you. Salt also helps flavour. water – use filtered water if you can. But if using tap water, boil it and allow it to cool to get rid of any chlorine which may hinder the fermentation. brine – after you’ve eaten the veg the brine can be discarded or used to season soups and stews. Or you can drink it. as a snack – my favourite way to eat them is to pick them out of the jar and snack. Fergal and I often chomp on fermented carrots while I’m getting his dinner ready. in salads – add a little crunch and zing. I wouldn’t make a whole salad from them though as it might be too much of a good thing. with rich / hearty meals – serve a little bowl of fermented veg with your next pork belly or lamb shank extravaganza. I love them with mashed potato too. with burgers – it’s a classic combo for a reason! Or view video recipe over here. ps. Did you enjoy this? If you’d like me to do a followup post on how to make sauerkraut, leave a message below and if there’s enough interest I’ll share that as well. Thanks Jules… I’ve been hearing lots about fermenting lately, and you make it sound so easy! I’d love to hear about sauerkraut! Thanks Jules! I’ve known the benefits of fermenting vegetables for ages, and now you’ve inspired me to actually give it a try! I recently started looking for pickles made without vinegar (pregnant woman cravings!) but no success. You’ve shown me how easy it is to make my own. Keen to learn more about sauerkraut, too. Thank you! Yes, I would love to hear about sauerkraut! I would love for you to share the sauerkraut recipe. I did not like it as a child and for a lotta years have shunned it. Then I pick up some from a coop and tried it as hubby likes it and I’ve been hearing a lot about fermenting too. Wow! Yum! but I’m not loving the price and we need to be careful of our pennies. I think I will try some after shopping this week. Thanks in advance. Am interested in the learning about sauerkraut . Carrot sounds good now to find a suitable jar. Thanks so much for the article. I have been wanting to learn to make fermented foods and I am going to try. Would love to learn to make all kinds. Thanks again. I would love for you to share the sauerkraut recipe. Carrots will be my 1st try later today. Thank you for making this so easy – I would love something on sauerkraut! Thanks for the tips on fermented veggies. I’m interested to hear about sauerkraut too. It looks like you have a following in that area too. Who knew it was so easy to ferment vegetables?! Thanks Jules, and it would be wonderful to learn how to make sauerkraut. I’d love to know how to make sauerkraut! Thanks, Jules. I would like to know more about making sauerkraut. I would love to learn how to make sauerkraut, I love it but always buy the commercial brand from Polish or German deli shops. I also love Korean kim chi which is a close relative. Please give us your sauerkraut recipe. BTW I make something similar in the form of “pickles” in which I use Persian cucumbers or turnips. I cut the cucumbers lengthwise and the turnips into half moons and simply put them in a glass vessel with a “little bit” of WHITE balsamic vinegar to cover the bottom of the vessel. Place in the refrigerator and now and then rotate the vessel so the vegetables are drenched with the balsamic. In maximum of two days the cucumbers are ready, crisp “half done” pickles. a dash of salt and heaven. the turnips take a bit longer depending how thick you have cut them. very nice to munch on while preparing dinner. Jules please do with the sauerkraut, I love the stuff and the canned variety is not that nice. These veg sound amazing..will be trying them asap! As a non meat eater I’m always looking for different ways to prepare veggies. Would love the sauerkraut recipe..I’ve tried the commercial one once, but never again. Thank you so much! Jules – love your delightful sense of humour that no one has died eating fermented vegs… You make the process sound simple as usual and would love to try making sauerkraut as well! Thanks for the “how-to” on fermenting veggies. It looks amazingly easy to do. I would love to see a post on your sauerkraut recipe. and in avocado halves, tacos, fish , coleslaw etc etc! Please do tell us about your sauerkraut ! LOVE the sound of your pickled onions Karen! South Indian foods Idli and Dosa are made with freshly ground (rice + white lentils in proportion) batter that is left to ferment overnight. Idlis are usually a healthy breakfast in India. These are usually accompanied by coconut chutney and sambar (made with lentils). One can even eat idlis with just a little bit of butter or ghee spread on them which little kids usually prefer. Just thought of sharing this as additional fermented food options. Hi….I didn’t see anything about adding vinegar. Is that not a helpful ingredient? Thanks! thanks Jules, & yes please to sauerkraut recipe. p.s. can one mix vegetables to be fermented, or should they be done in separate jars? Thank you for this inspiring post. 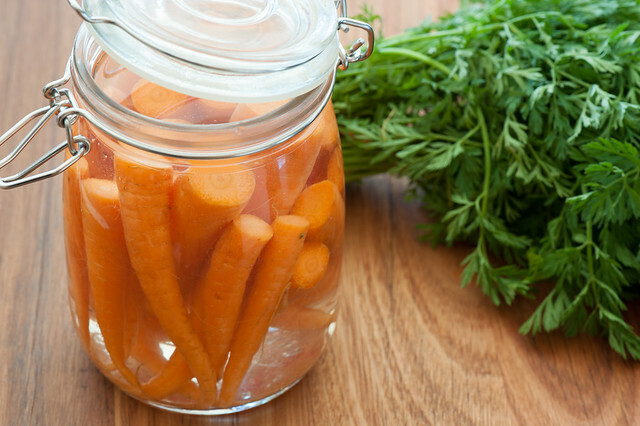 I will have to try the fermented carrots very soon. Please talk about sauerkraut ! Great post. I enjoy fermented foods, however I forget to make them, so this a great kick-in-the-pants for me. I would love to read your sauerkraut post! I have been really interested in learning to ferment vegetables but worried about not doing it right. This sounds like a perfect starting place and I would love to learn how to ferment sauerkraut. Especially with all the cabbage we are about to have here. I took a class on making sauerkraut but I was too intimidated to actually try it. I have made kimchi which ferments more quickly. I would really love follow-up posts on this. PS Most sauerkraut that is available in supermarkets has weird chemicals. Farmer’s markets seem to be the only places to get the real thing. Did not realize it was so easy. Would like to hear how to make sauerkraut too. Thanks! Very excited to see this post. Would love to hear more. Thanks Jules. Lots more fermented foods please. And any other food based suggestions for gut health. Thank you for recipe for fermented vegys. Commercial sauerkraut is quite strong, would love a mild version please. Goes really well with deli meats. Thank you so much for sharing you experience with PCOS. I think i will also check out this Debunking workshop. I have been fermenting as well. I love making dill pickles and currently am making sauerkraut and kombucha tea! I’m looking forward to trying some fermented vegetables. Also, I would love for you to share your sauerkraut recipe with us. Yes please to the sauerkraut, and can I reuse the brine for my next batch of fermented veg? I would love to see your sauerkraut recipe thanks. Can you please do a follow up Sauerkraut recipe. I din’t realise fermenting was so easy. I just recently decided I was ready to start fermenting… I just needed to look up a recipe. Perfect timing! I would love to know more about sauerkraut! My doctor recommended fermented veggies. I definitely prefer to make my own. So do share the sauerkraut. Hi…I love fermented vegetable and I am in heaven when I find good sauerkraut…I was wondering if they talked about yellowing of the teeth in your course…it started to happen to me when I started to drink Kombucha…and I can’t seem to get them white anymore. No one mentioned teeth yellowing Mello… And to be honest I didn’t notice the colour of anyone’s teeth at the course! I can’t imagine it’s from the bacteria…. could it be something else in the kombucha? Hey Jules Clancy break it down for me! You are the goddess of translation, you breakdown the seemingly impossible/scary – i.e. delicious healthy meals of my own creation for my family and friends with the encouraging hand of the nona we never had on our shoulders. and I’m in need! As a mum bent on whole food nutrition I’m reading allot about the benefits of gut flora health and supporting my families with preserved and fermented foods. But coming from a SAD diet background and really never eating anything more than 3days old it’s scaring me to start!!!!!! With your minimalist approach, delicious results and food scientist background I know you’re the lady this internet audience neeeeeeds to hear from. Is it pathetic I’m so excited I’m doing a dance? Great minds Meegan! And so glad you’re finding Stonesoup helpful… I love hearing that! a few variations of pickled salads, such as multi colored beet or perhaps even pickled apples or melon? ( I hear they are yummy and a “change” from the usual). I am a big fan. Thank you! Thanks Jules! This is great. Question: are store-bought pickles etc any good at providing the advantages of fermentation? My understanding is that store bought sauerkraut, pickles etc don’t provide those benefits. Or is it just a matter of scale/levels -homemade being best but store bought okay? Great question Wend! The problem with some store bought pickles is that they haven’t been made by fermentation so there’s no live cultures. Usually just salt, vinegar and sugar added. I have never liked sauerkraut and would love to try and find a recipe I enjoy. I was the same Heidi but I’ve really found keeping it mild is the key! Dying to try this – thanks so much! And yes to the sauerkraut please! You make it seem so simple, I’m definitely going to try this. I have fibromyalgia and chronic fatigue, so energy is limited. A friend at work just gave me a box of her home-grown veg, and now I know what to do with some of them. I’d love to see your take on sauerkraut! I rarely use fermented foods beyond yogurt, but I would be very interested in a (hopefully simple) method for making sauerkraut. If it is easy to make, I would probably make my own and use it more often. Cabbage is one of my favorite veggies. When I became cook for my two daughters after my wife’s passing (many years ago), we had a lot of coleslaw and chili — easy to prepare, keep, and improvise on. I love your website and spirit, anxious to enjoy your sauerkraut! I’ve been thinking of trying to ferment some veg for awhile this has just confirmed that! I’d be interested in homemade sauerkraut. Thanks Jules! Please do. I lived in Germantown, WI and I never learned how to make sauerkraut. I’ll appreciate it. Thanks for your wonderful and inspiring information. I would love to have the sauerkraut recipe please. I would love to know how to make sauerkraut and hope you will share your knowledge with me. I love sauerkraut and I know homemade would be even better. So please do share. I had never heard of making fermented vegetables except sauerkraut. I’m excited to try making some fermented vegetables. I am also very interested in making sauerkraut as I have never cared for the store bought kind my mom bought when I was growing up. I most enjoy your posts that throw light on the intersection of… exploring new foods for health and eating food that really tastes wonderful. When you go the extra distance beyond “tastes great” to include “incredibly good for you,” I perk up. Your fermented veggies post is a perfect example. Examples of others’ afflictions reduced by good, good food would likewise catch my interest. On a financial note, if you encouraged me to pay you what ever I think is fair for the boon of reading your posts year in and year out, I would. I bet others would, too. I really do not want to buy another cook book! You seem to enjoy your Fergal, your Irishman and your food. Good juggling! I wish you success in all seasons. Would really appreciate you posting some info on sauerkraut. I have recently been taking some interest in fermenting and your post has shown me just how simple it can be. You are inspiring me to actually just give it a try. Yes! Please! More about fermenting veggies! I guess I’ve been living under a rock or something – this is the first time I’ve ever heard of this (and I’m 67 years old!). I’ve been a vegetarian for 2 years now and am FOREVER looking for new ways to make veggies taste “different.” Has to taste GOOD, though, or in the garbage it goes. This fermenting thing could be opening up a whole new world to me! I’m very excited, very interested! Thanks for waking me up to this! Simple and great idea to add fiber and improve intestinal health overall. Thanks, Jules! Yes, yes, I’d love to have the sauerkraut recipe. I try to learn about and eat healthy foods and would love to have the sauerkraut recipe. I’d like to know how to make sauerkraut, please. Would love your sauerkraut recipe please. Assume this method is not suitable or best for cabbage then? Yes Please!! And more on fermenting foods please! For those on FODMAP diets for IBS etc, the word ‘fermentable’ (the “F” in FODMAP) means that those foods must be avoided (like onions and other wonderful things) but by fermenting them first, and allowing the gases to escape, they won’t be fermenting so much in our guts (and causing gas to escape at inopportune moments ;-) ). Thank you so much for your fermented veg recipe. I have carrots and sea salt. And I have jars. I’ll start my first batch when I get back from getting some bottled water, broccoli and cauliflower. Unfortuantely my city water has both chlorine and floride in it. And yes, yes, yes, I would like to know how to make sauerkraut and any other fermentation you would care to share. I asked and you have delivered. Thanks again. Would love the sauerkraut recipe! Also, know anything about the health benefits of cabbage? Have been looking for years for a recipe for sauerkraut that is not too complicated! Yes, please! Is there a reason I should not cheat by using the liquid left in a store bought pickle jar? would love a post on sauerkraut. These pickled vegetables look so easy I cant wait to try. I am from Melbourne Australia and absolutely love your site. I have been fermenting for years very successfully ( my favourite is turnips) but not great with cabbages so your sauerkraut recipe will be most welcomed. Keep up your great blog!!!!! Another inspirational idea to get me busy!! Always share a sample of your ideas with friends – the chocolate kale cake has to be everyone’s favourite so far!! Would love a sauerkraut recipe as I find the commercial stuff is soft and unappetising. Thanks!! Thank you Jules, always simplifying things, I feel like I can’t wait to try this out :) I remember my mother used to make it with turnip (peeled and cut) and add one beetroot to the ferment to make them red, yum! I’ve never heard of this before but it sounds easy so I’ll give it a try. Also would like to see a post on Sauerkraut as I do like it but have been put off buying the jars that are available in the supermarket. Looking forward to your instructions for making homemade sauer kraut. Thank you. Yes please, being able to make my own sauerkraut would be wonderful! Hi Clance – love your post! Do you remember making Sauerkraut at Uni? I found the lab notes in a big clean out not long ago – oh the fond, and not so fond memories! yes, pls give the recipe for sauerkraut!! and also, dill pickles?? you said the rind n zucchini came out mostly like pickles, so dill pickles can’t be far off, right?? also, w dill pickles (which i WORSHIP) i can also make relish, so…? PRETTY PLEASE! I would love to learn how to make sauerkraut, as well as kimchi, beet kvass, etc! Did not know about fermenting vegetables and will definitely try this simple method, thank you. I would be interested in the sauerkraut recipe also. can this brine be used for a new batch of veggies, or is that a nono? I am a newcomer to your site. I really enjoyed this post and look forward to fermenting some veg. My mother did the same with baby cucumbers, adding lots of fresh dill – Just delicious! In her memory, I’d love to try your sauerkraut recipe. Thank you. Would love for you to do a blog on sauerkraut! I often buy the grocery store stuff, rinse it and doctor it up myself with wine, peppercorns, juniper berries and pork…but it takes a lot of time. Would love to read about your take on it! Re the question about sauerkraut… My husband is German, and sometimes he just craves the food that his mother cooked for him when he was a child. So double yes, I’d love a sauerkraut recipe. Thanks! Yes to the sauerkraut and thank you for this post. What a great idea. I didn’t know it was this easy. Would love to learn how to make sauerkraut. Great. Have just done some courgettes! But how come they are good for you when so much salt is used? Yes, yes and yes to the kraut! Thank you! You have many requests for sauerkraut I see, so I would like to add my name to the list! Yes please to how to make Sauerkraut. Been thinking about doing it for a while, but got a little nervous. Nothing to be nervous about Judith! Have been experimenting with making sauerkraut this summer. made both green and red ‘kraut as well as flavored with caraway, fennel, celery seeds or dill. Be interested in seeing if your recipe is different from mine (1000 g sliced cabbage, 20 g salt, 2 tbsp liquid from previous batch of ‘kraut). The liquid ensures I have good bacteria in the mix, since I do not trust that any “wild” bacteria in my house. for very first batch I used whey from organic yoghurt with live cultures. Please give your sauerkraut recipe. I have been making it for years but like to try any new twist. When I was a child my mother always added apple slices to the brine. (She did it in large crocks) the fermented apples were my brother and my favorite part. Thanks so much for this. I have been interested in fermenting vegies for a while now but didn’t realise it was this easy! Please post your sauerkraut recipe!! I became a fan of sauerkraut last summer, and would love to learn how to make it myself. This is exactly what I’ve been thinking of lately. I have started a batch of sauerkraut, but I’m so confused about if I am doing it correctly. 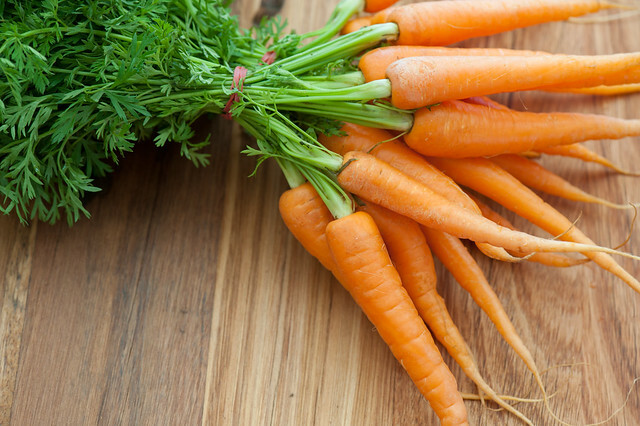 Now I can hardly wait to start a batch of carrots! I would love more information. Thank you so much! Good for you trying the kraut Jennie! Thank you for posting this. I’ve been following a paleo-ish diet for a while and have been reading about how good fermented veggies are for you, but I had no idea it was so easy to make them. I’ll be making up a batch asap. I have been wanting to try fermenting for a while and just started some cabbage the other day—first taste test is tonight! Would love to see a post about your sauerkraut technique. I like sauerkraut so, yes please post it. Would love your sauerkraut recipe. Thanks! Loved the article on fermented vegs. Definitely going to try them & would love to have the sauerkraut recipe! I would love the sauerkraut recipe, do you also have a Bavarian version? Thanks and I love your emails, they make my dinners interesting! Would love the sauerkraut recipe. I’ve been meaning to try this for ages so thanks for the tips! I just started a batch of baby carrots and cauliflower yesterday. Just one question though… does it matter if the cauliflower is floating? I can’t get a few stray morsels to stay completely submerged. I perhaps should have packed them better. Yes please to the sauerkraut recipe. I have read quite a few but I imagine your recipe will be straightforward and clearly communicated. Thank you. Yes please re the sauerkraut! My Greek man was only just saying last week that we should get into more fermented foods, and that he misses his mother’s cabbage! I will love all the recipes of fermented vegetables. I just eat them raw. You could cook them but the bacteria won’t survive the cooking process so it defeats the purpose a little. Yes the cloudy water is normal as the fermentation happens so you’re all good. Thanks for the idea of using carrots. Some garlic cloves and dill will make it happy! i put also fresh slices of garlic and dill as a must. also big chuncks (3x3cm.) of green cabage together with thick slices of carots. very tasty. Just be careful with using garlic because there is a very small risk of botulism developing. Personally I don’t use fresh garlic in my ferments. Thank you for this article. I was intrigued by two keyword in your article – gut and ferment. I was wondering how they are related. And then I found out that you were actually talking about pickling – which is what we call in our part of the world. And guess what, we just started having “pickled” gooseberries a month back. So totally get what you are talking about. Thanks again. The problem with the term pickling is that it also covers food that has had salt or vinegar added to it – not necessarily fermented foods. Did they start fermenting anyway? I think the chlorine dissipates after 24 hours so you should still get a ferment it will just take a little longer. Hi, I just recently came across this site and I really like its easy to understand concept! I instantly tried the fermented carrots, I love it! Now I’d really like to know whether or not there is a fruit fermentation method that’s just as perfect! I read fermenting veg. etc can cause esoph. cancer? Any truth to this or do you need to eat this in moderation? I’d love the sauerkraut recipe and also would like to know if it is advantageous to use a fermenting crock. Have you a recipe for pickled vegetables with vinegar base? Maybe even one that goes with desert?? Yes yes and another yes for kraut recipe – Thank you. I love sauerkraut and just made my first batch of fermented carrots from your recipe. Please print it. Yes i am new to this i need to know a bit more.Is their any way to ferment vegetable aand fruit. YES!!!! Teach me to make my own krout!!!!! Just found you, but I’ll be fermenting most of those veg you mentioned, so please, yes to the Sauerkraut too. Great info here – would love to know more so ‘YES PLEASE’ to the Sauerkraut recipe! Oh Yes please! That would be fantastic.